Take a look at F-STOP Magazine Issue #46, April/May 2011. This issue’s Group Exhibition, titled: All ABout Me, is all about Self portraits. A few of mine are included. Happy Worldwide Pinhole Photography Day 2011! 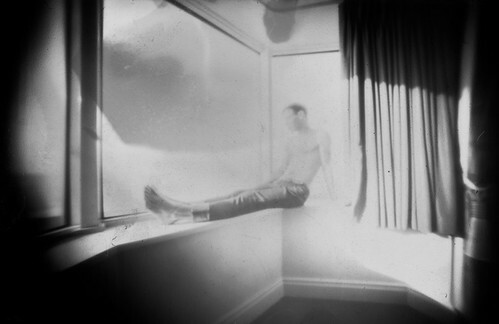 I recently took part in Lucy Phillips’ pinhole collaborative project entitled “What Cannot Be Seen“. Lucy sends out matchboxes loaded with a paper negative and invites participants to photograph what cannot be seen. The above image is my contribution to the project, which i shot while working on my own photo series with the lovely John Barr Ross. This is a photo of John looking out across the seafront whilst sitting on the window ledge of a brighton hotel. despite the large window the people down below seem oblivious to being watched as they go about their daily lives ….though if they were only to look up…. Lucy will be exhibiting her project at the De La Warr Pavillion next month. (Hopefully my image will be one of the few she selects for the show)….Good luck Lucy!